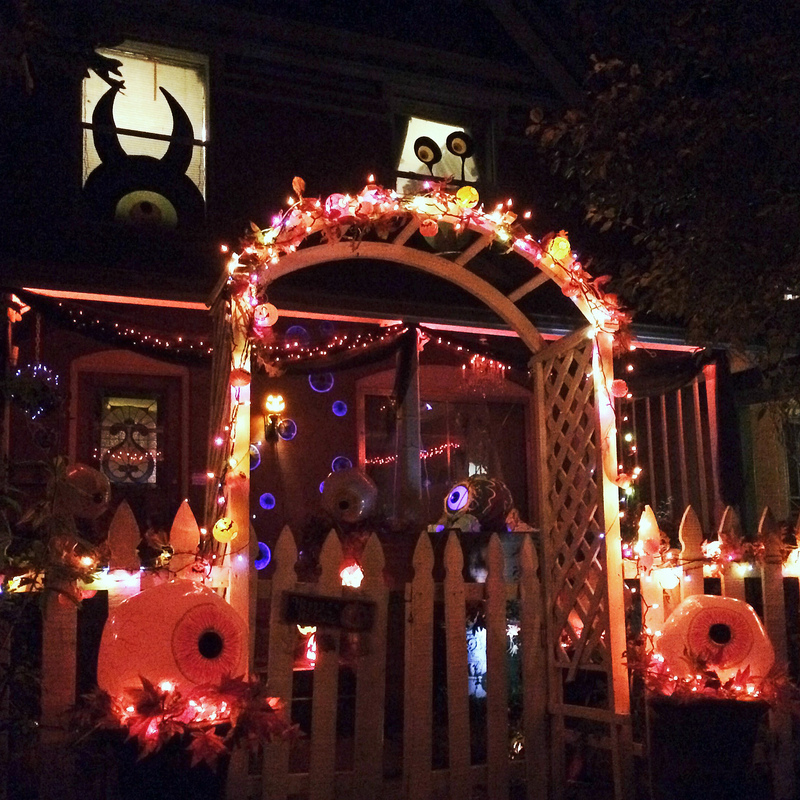 We changed things up just a bit in the front yard this year for our favorite holiday, Halloween! Inspired by my new “Crawling Eye” prop (see the DIY here) we went with creepy eyes. 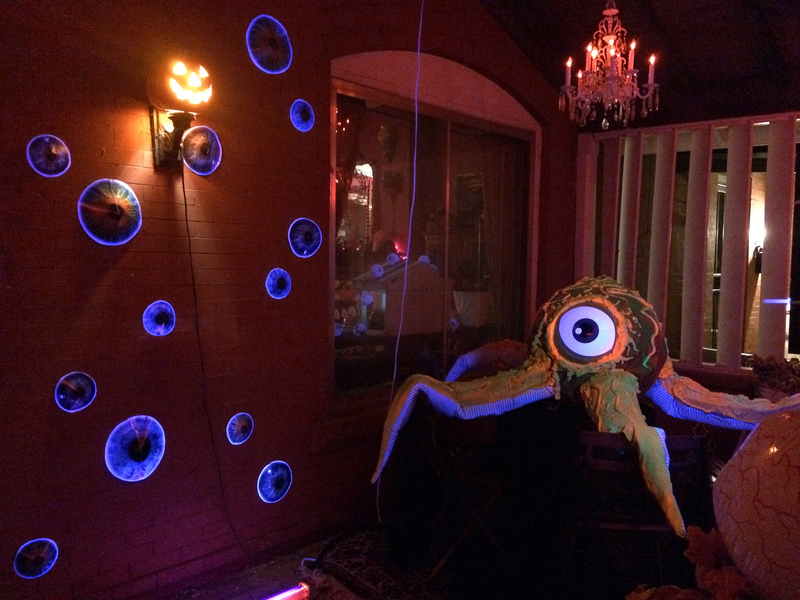 I found some blow-up eyes online for about $3 each and put them in the plant pots and on the porch on top of our old fake fall leaves and orange lights. 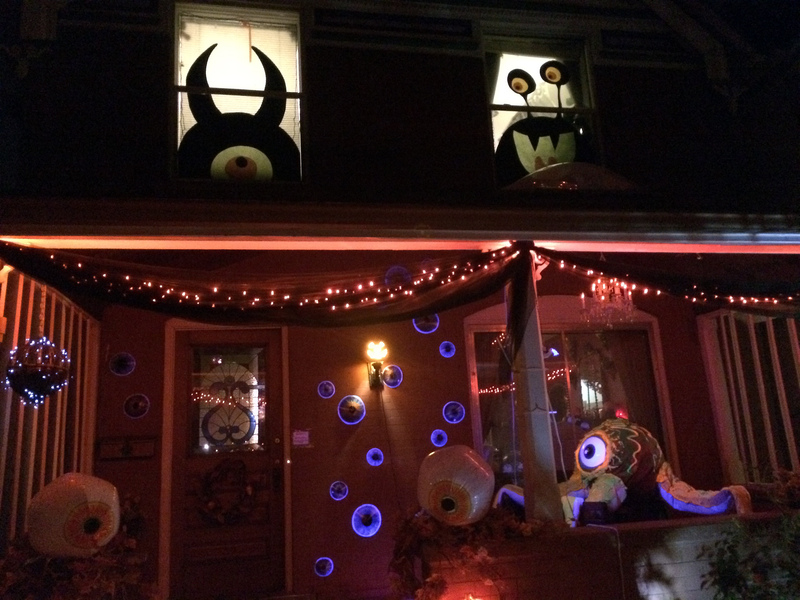 I also made the silly big-eyed monsters in the upper windows from black poster board and colored tissue paper. (Inspired by these amazing monsters: http://fashionnaction.blogspot.com/2011/10/googly-monster-house-halloween.html ) The eyes on the porch wall were left-overs from a party years ago (just eyeballs printed out on gloss paper from google images) I only spent about $40 for this year’s update, everything else (black fabric, fake pumpkins, black lights) are all things we’ve had for years, just moved around. Enjoy! This entry was posted in Halloween and tagged crawling eye, creepy eyes, DIY Halloween decor, Halloween, Halloween Decor, Halloween decorating, outdoor Halloween decorating. Bookmark the permalink. ← Beware the Crawling Eye! A Fun Halloween DIY Using an Exercise Ball and Old Sheets.